" terminated with exit code 0, stopped in structure culvert *.f90, error code 8393"
Then when I click out of that window, I get "ERROR: Could not open file *_XMDF.h5". This does not happen when using multiple simulations with the same mesh. Is there a way to run multiple simulations with different mesh? The two different mesh are generated from the same "Domain" based on different DEM layers. I look forward to any advice. Thanks! This may not be caused by having a third simulation with a different mesh, but rather it is more likely something to do with the setup of a culvert structure in your simulation. The first thing I would check is to make sure that the BC arc and Material polygon snapping is the same. The images below show how the BC arcs for a culvert and the "unassigned" material zone are snapped to the mesh. The dotted lines can be turned on in the display options and are called "Snap Preview". They are helpful to see how the materials and BC arcs are spatially assigned to the mesh. The image below shows a valid snapping configuration. Notice how the dotted snapping lines from the culvert BC matches the dotted snapping lines from the material polygon. The image below shows an invalid snapping configuration since the snapping edges are not the same. 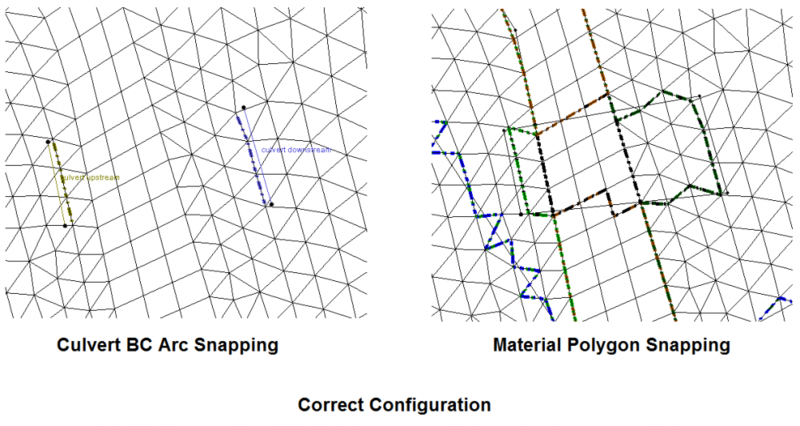 Likewise, the image below shows inconsistent snapping between the BC arcs and material polygons and is therefore an invalid configuration. Thanks Calbert for this helpful advice! The BC and materials did snap at the same locations. But when I took the unassigned material zone out of the model just to check, the simulation was able to run fine. The unassigned material zone, even though it snapped with the BC, did intersect with and include other material polygons complicating the snapping. I will probably need to simplify by merging all the unassigned material zone into one polygon and also make sure the BC edges snap in the same locations.